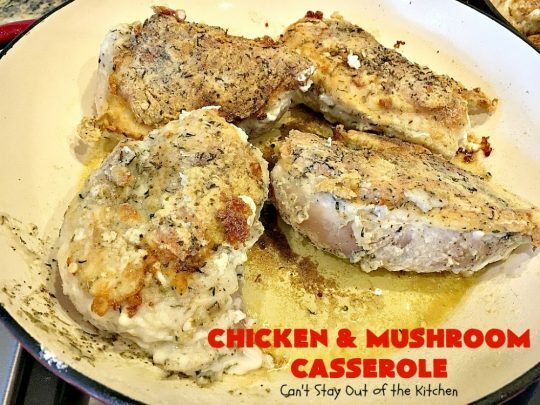 Chicken and Mushroom Casserole is absolutely sensational. We eat a lot of chicken for dinner, although I have to admit to being partial to steak. One of these days I need to make up a batch of my homemade Fried Chicken. It’s been sooooooo long since I’ve made it. 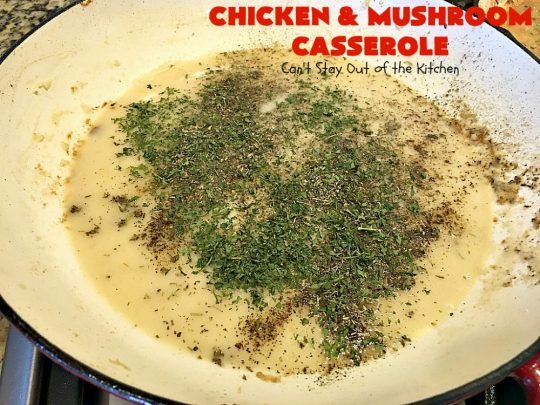 I make chicken in casseroles and I make chicken with pasta. 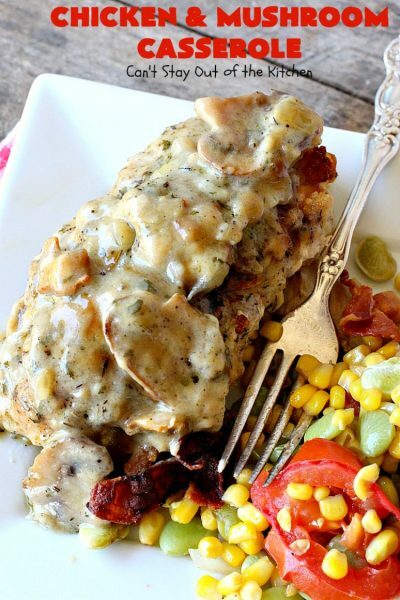 I love chicken and we love this delicious entree. 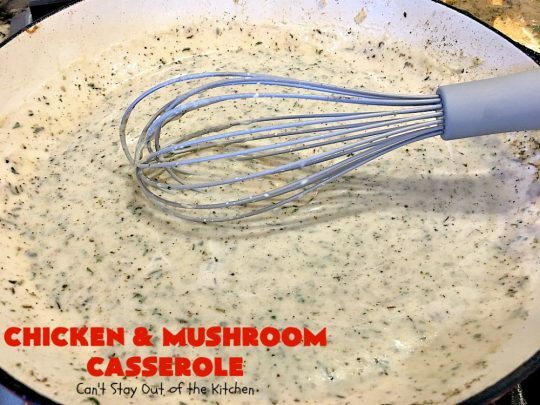 This casserole is smothered in a delicious, thick and creamy sauce with mushrooms, onions and garlic. I made it gluten free by using gluten free flour instead of regular all-purpose flour. 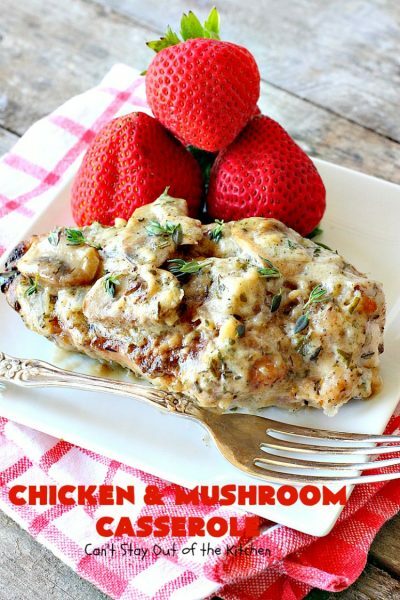 This recipe can be served over rice, mashed potatoes or even toast or biscuits. But you certainly don’t have to serve it over anything if you prefer. When I originally posted this recipe in April 2015, I was following a recipe I had found on Pinterest. The recipe was okay, but it was insufficiently seasoned. I felt it needed more. Much more. So I started from scratch and decided to remake the recipe entirely. This time, I highly seasoned both the chicken and the sauce with herbs like thyme, rosemary, sage, poultry seasoning and marjoram. I seasoned it the way I enjoy chicken dishes. Talk about amping up the recipe to the next level, yessiree. I made sure the sauce was a little thicker too. It turned out more like a gravy and not thin and watery. The entree turned out so well this time, there was absolutely no disappointment with the outcome. I served the chicken along with some Down Home Succotash for our Friday night care group (August 2018). I didn’t serve it over rice, potatoes or anything else. 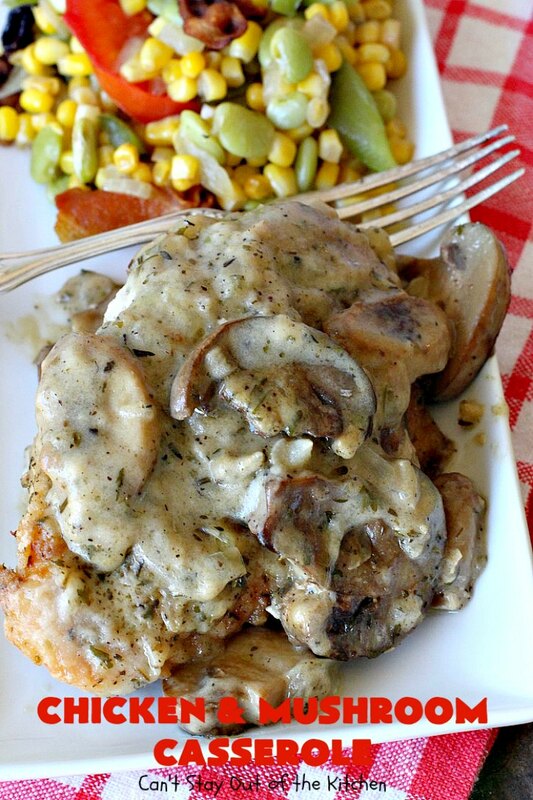 We all enjoyed having a thicker gravy-type sauce to spoon over the chicken. 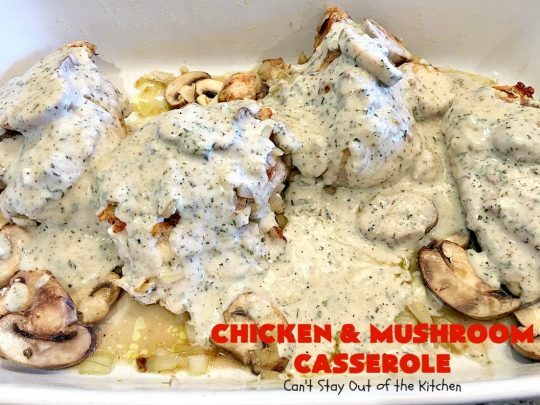 Without exception, everyone totally loved this Chicken and Mushroom Casserole. The flavors of the chicken and sauce were outstanding. I even had some folks ask me what kind of seasonings I used because they enjoyed the taste so much. 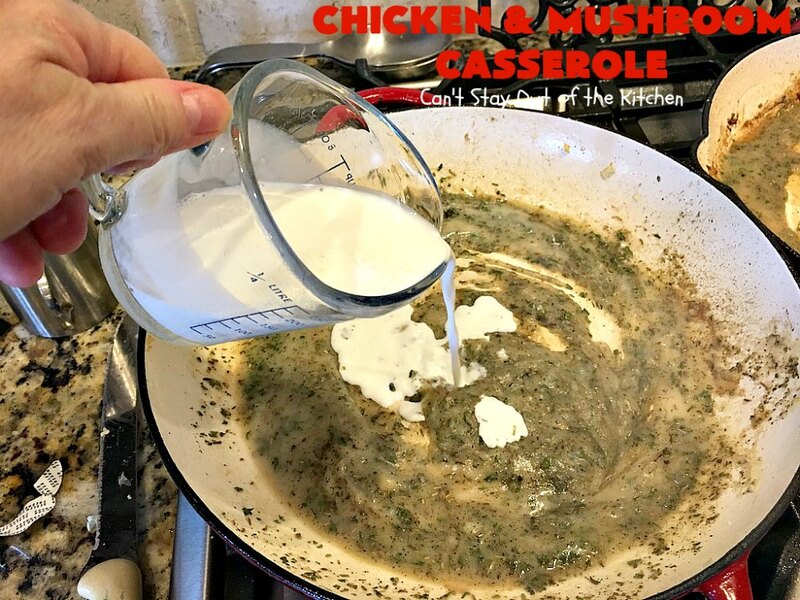 Chicken and Mushroom Casserole has a fantastic, thick and creamy mushroom sauce that’s quite delightful. You can serve Chicken and Mushroom Casserole with rice, mashed potatoes or by itself. 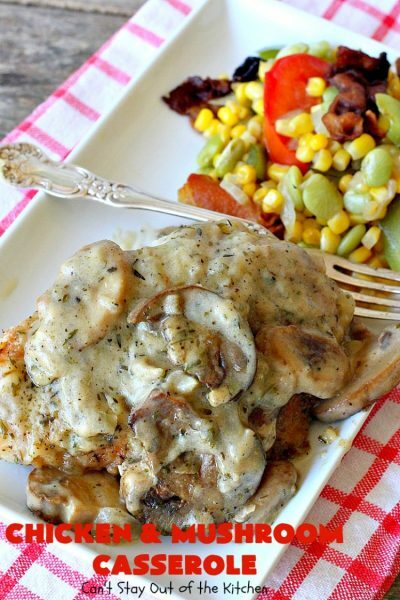 I loved the idea of having mushrooms in this dish. They added great flavor and texture. I served this casserole with Down Home Succotash. I used these ingredients for the chicken. 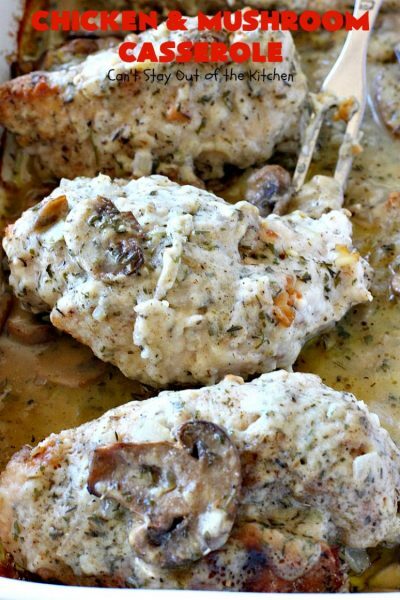 Sprinkle each side of chicken generously with salt and pepper, thyme and marjoram. 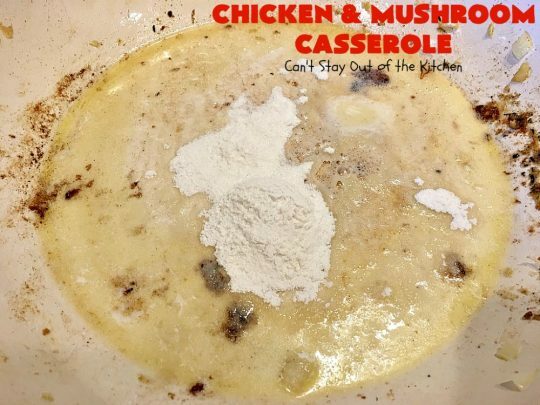 Dredge chicken pieces in gluten free flour. Pour olive oil into skillet. Fry chicken about 10-15 minutes until lightly browned. Turn chicken pieces over and fry another 10 minutes or so. The meat doesn’t need to cook all the way through because the chicken will continue cooking in the oven. 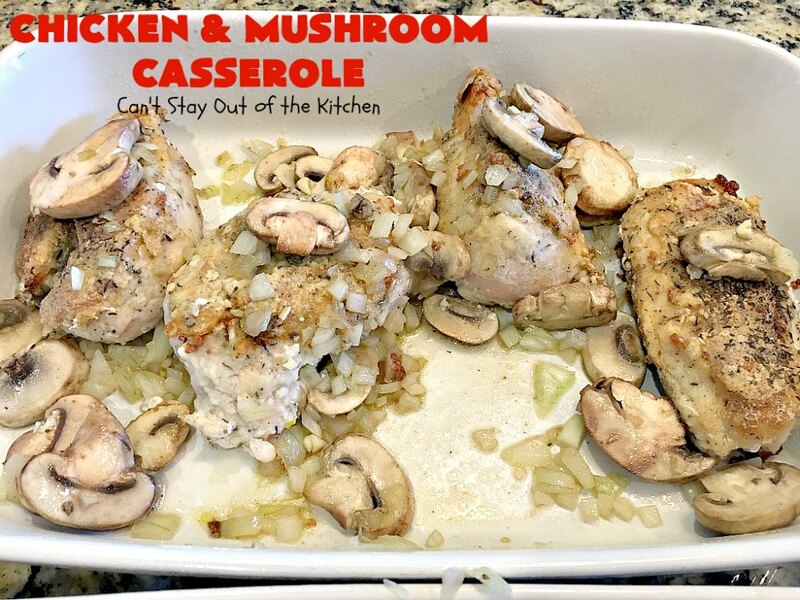 Remove chicken and place in greased casserole dish. Wipe out skillet with paper towels and add remaining olive oil. Add mushrooms and onions and saute 5 minutes until tender. Add garlic and saute an additional minute or two. Spray a 9×13″ glass baking dish with olive oil cooking spray. Place chicken into prepared baking dish. 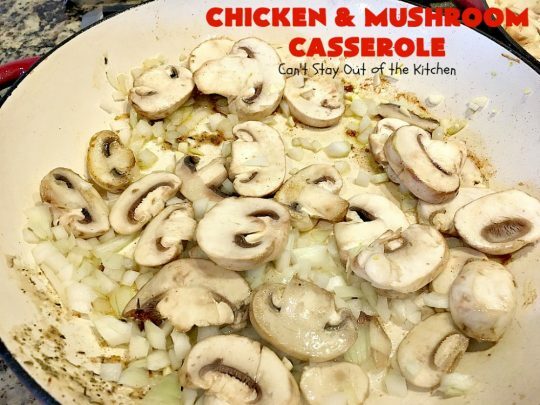 Pour mushroom-onion mixture over top of chicken pieces. Set aside. Meanwhile, in the same skillet, melt butter. Add gluten free flour. Whisk flour and stir until lightly golden – about 1 – 2 minutes. Slowly whisk in chicken broth until mixture is creamy. Add lemon juice. Add half-and-half slowly and whisk to combine. If you want a slightly thinner sauce, you can add additional half-and-half now. Allow sauce to thicken. Check seasonings. Add additional salt and pepper, if desired. Remove from heat. 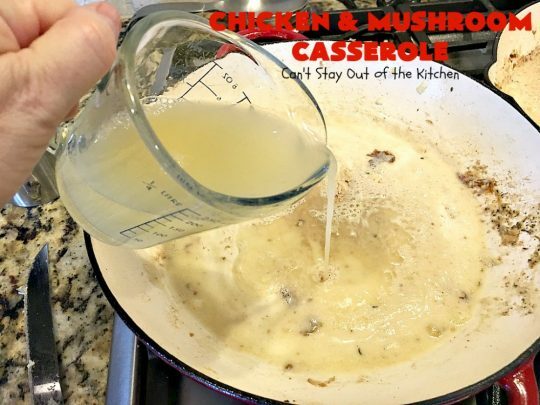 Pour sauce over top of mushrooms. Cover with foil. Bake at 350 for 45-60 minutes or until done. Remove foil. Garnish with fresh parsley or thyme, if desired. I was trying to cook my meat faster because I was on a time crunch and my meat was not totally defrosted. I cooked it at 400 degrees for about an hour. 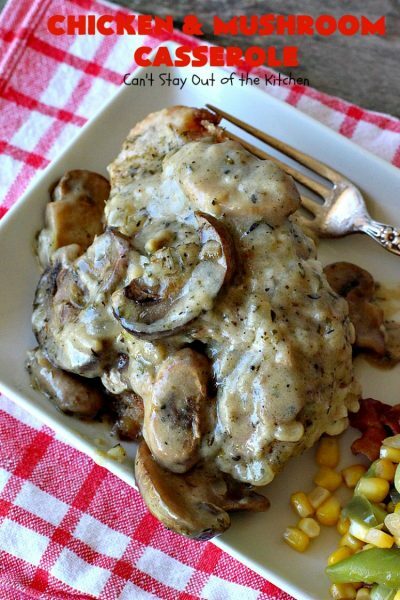 Serve Chicken and Mushroom Casserole over hot, cooked rice or mashed potatoes. 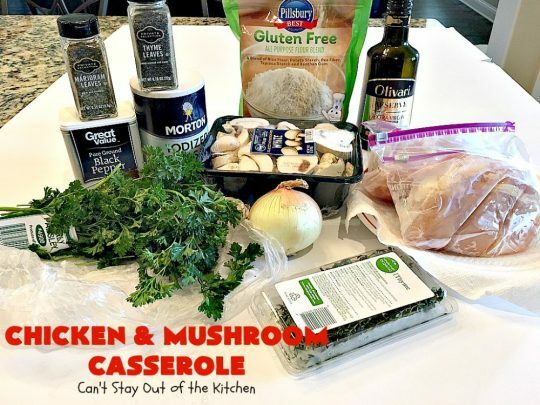 Chicken and Mushroom Casserole is a terrific gluten free recipe. I served it with Down Home Succotash. We enjoyed the seasonings of thyme, marjoram, rosemary, sage and poultry seasoning. They really added delicious flavors to this tasty chicken dish. This amazing stick-to-the-ribs dinner is comfort food extraordinaire. Chicken is cooked with mushrooms, onions and garlic and seasoned with several herbs to amp up the flavors. 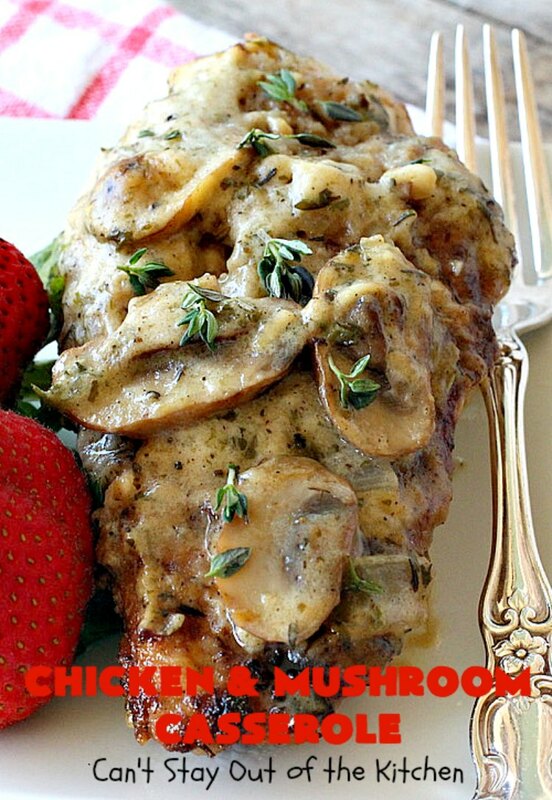 It's a wonderful entree for company or holiday dinners. Gluten free. 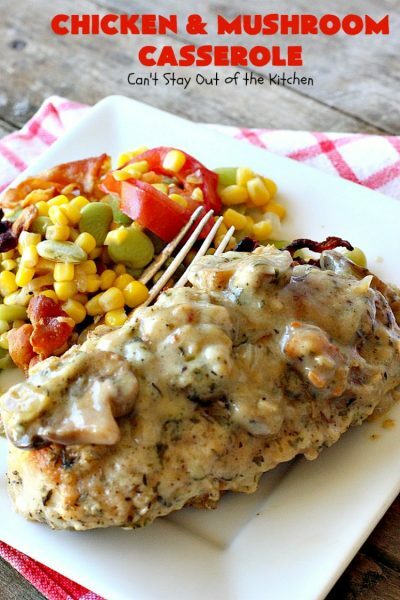 Sprinkle both sides of chicken pieces generously with salt, pepper, thyme and marjoram. Dredge seasoned chicken pieces in gluten free flour to coat well. Add 2-3 tbsp. olive oil to a skillet and heat to medium-high heat. Add chicken and cook about 10-15 minutes on each side until nicely browned. 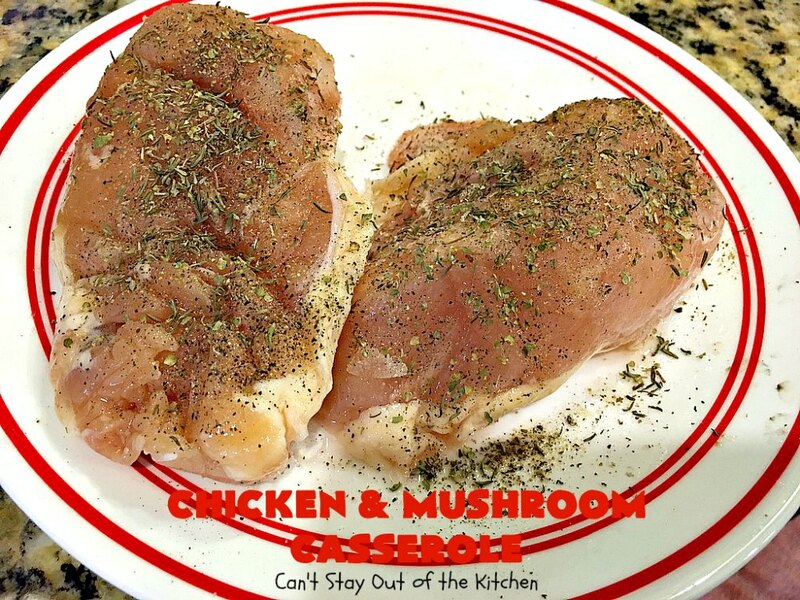 Remove chicken and place in a 9x13” glass baking dish sprayed with olive oil cooking spray. With paper towels, carefully clean skillet. Place skillet back on burner and add remaining olive oil. Add onions and mushrooms and sauté about 5 minutes until tender. Add garlic and cook an additional minute or two. 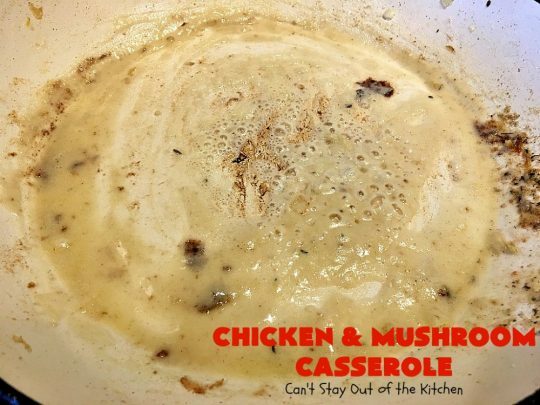 Spread mushroom mixture over top of chicken in baking dish. In the same saucepan over medium heat, add butter. After butter has melted, add flour and cook about 1-2 minutes to make a roux. Slowly add chicken broth and whisk to combine. Add lemon juice, salt, pepper, thyme, rosemary, marjoram, parsley, sage, poultry seasoning and half-and-half and whisk again. Allow sauce to heat until thickened, whisking frequently. Once the sauce has thickened, check for seasoning. Add additional salt and pepper or other seasonings, if desired. Pour sauce over top of chicken and mushroom mixture in baking dish. 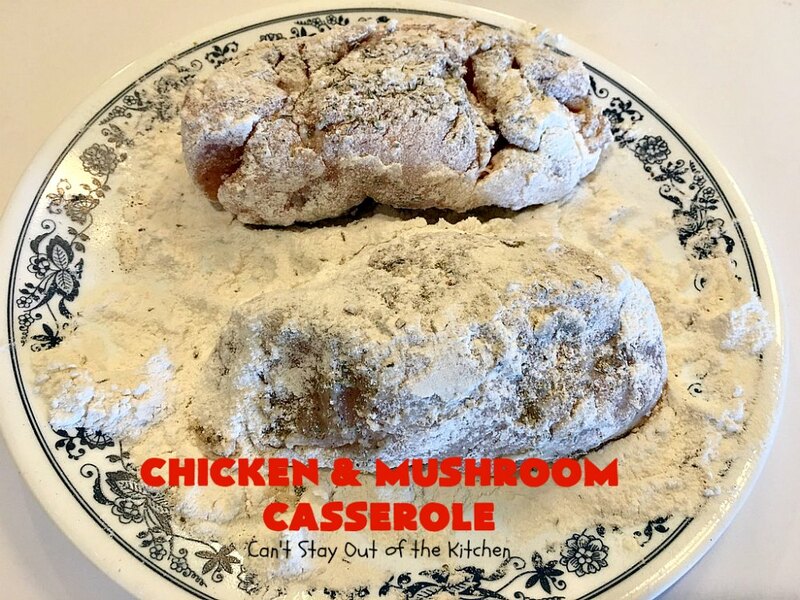 Bake about 45-60 minutes at 350°, until chicken is cooked through. 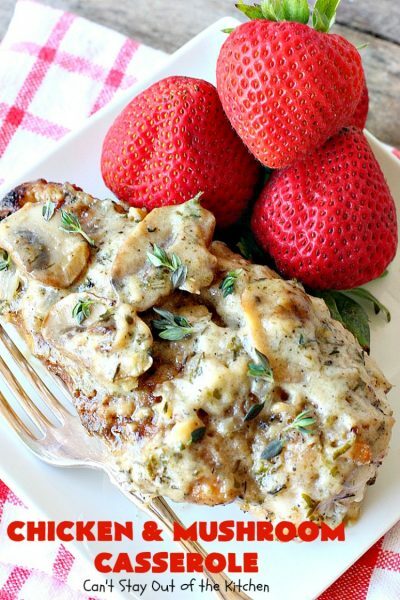 Garnish with fresh parsley or thyme, if desired. Serve over cooked rice, mashed potatoes or noodles. NOTE: If you want a slightly thinner sauce, use a full cup of half-and-half rather than merely 1/2 cup. NOTE: My chicken was partially frozen so I baked it at 400 degrees for about an hour. 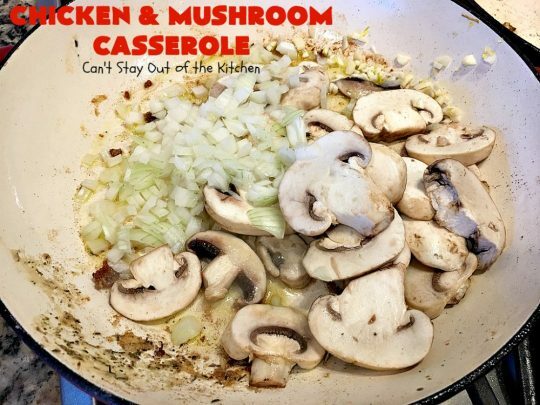 If your chicken is thawed when you start pan-frying, the casserole may be cooked through by 45 minutes. Check with a meat thermometer to ensure doneness. This old-world Ukrainian dish is simple yet a delicious way to get a stick-to-the-ribs dinner. 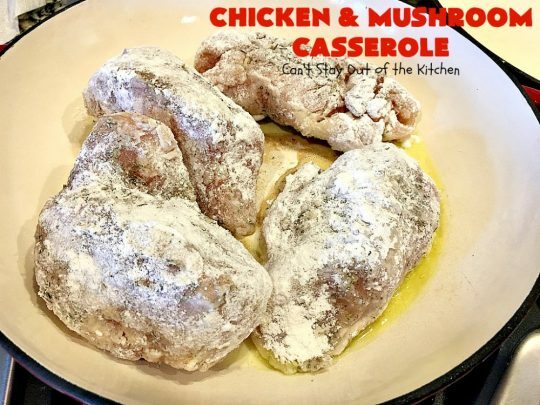 Serve this casserole over rice, mashed potatoes or noodles. Gluten free. Dredge in flour to coat well. Add dredged chicken pieces and cook about 5 minutes on each side until nicely browned. Remove chicken and place in an 8×12” glass baking dish sprayed with olive oil cooking spray. With paper towels, carefully remove grease from chicken and clean pan. In a saucepan over medium heat, add butter. Add lemon juice, pepper and haand-half and whisk again. Bake about 30-45 minutes at 350°. Chicken and Mushroom Casserole is savory and delicious. Our company loved this chicken entree. Chicken and Mushroom Casserole turned out so well served with a side of Down Home Succotash. Oh, Teresa, it maybe breakfast time, but I want dinner 🙂 Yum!